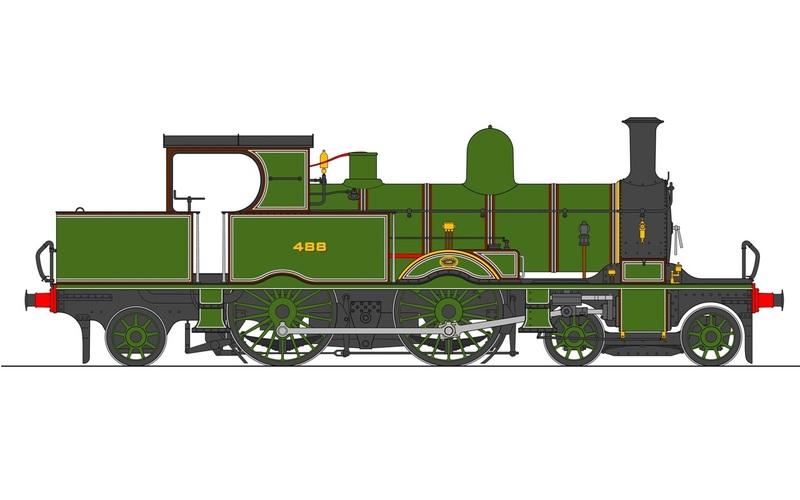 William Adams’ 415 (later 0415) Class was based on his earlier LSWR 46 Class, with London suburban services in mind. The design was based on a 4-4-0 design with a trailing radial axle added to support an enlarged coal bunker. The radial axlebox worked in a corresponding curved hornblock the centre of which was struck near the middle of the chassis. Many tank engines so fitted earned the soubriquet ‘Radial Tanks’, or simply ‘Radials and the 415 Class was no exception. The enlarged coal bunker was also designed to incorporate a back tank for extra water storage in addition to the capacity of the side tanks. Coupled to a short wheelbase and guiding bogie, the locomotive was relatively manoeuvrable on tight curves, a feature that was to ensure the survival of some of the class later on. Production began in 1882 when a total of four engineering companies were contracted by the LSWR to construct the new class, which numbered 71 when production ceased in 1885. These were: Robert Stephenson & Co., Dübs & Co., Neilson & Co. and Beyer, Peacock and Company. This arrangement was because Nine Elms, the LSWR’s own locomotive works, was already stretched to capacity in terms of production. Our model is based on the Neilson batch, readily identified by the curvaceous frames in front of the smokebox. Upon the appointment of Dugald Drummond as Superintendent of the LSWR after Adams’ departure, the class was modified slightly, with the application of his lipped chimney in place of the stovepipe version that the locomotives were equipped with when built; in due course they also acquired Drummond boilers with the safety valves incorporated into the dome. Coal rails were added to the bunker in an attempt to increase capacity. Because the class was not considered to have a long working life under Robert Urie, they were not equipped with superheating. The 0415’s tenure on the London suburban services was relatively short-lived and with the introduction of Drummond’s M7 class 0-4-4 tanks and electrification of the suburban railway network the class was generally removed from the London section of the LSWR to rural branch duties from 1895. In 1903 the link was made between the class and the severely curved Lyme Regis branch and with the trailing axle modified the flexible ‘Radials’ proved to be highly suited to the operating conditions of that line. As a result, two were allocated to Exmouth Junction shed for the Axminster to Lyme Regis service, joined in 1946 by a third example retrieved from the East Kent Railway. Here we must introduce No. 488 (0488) from the Neilson batch; having been used for war work in WW1 the locomotive was one of a couple bought by the Ministry of Munitions before being sold, in 1923, to the redoubtable Colonel Stephens of light railway fame for use on the East Kent Railway. However, the locomotive was little used and set aside by 1943. In 1946 the Southern Railway needed a third ‘Radial’ tank for the Lyme Regis branch to cover locomotive unavailability, and found 0488 (East Kent Light Railway No. 5) out of use, but intact. In March 1946 the SR purchased it for £120. It was extensively overhauled for SR service at Eastleigh, where it received its updated number, 3488. The three locomotives continued on the Lyme Regis branch after Nationalisation due to the lack of better motive power to cope with the curve restrictions in place on the line. By 1958 all three were showing their age, and the end finally came in 1961. However the final example, No. 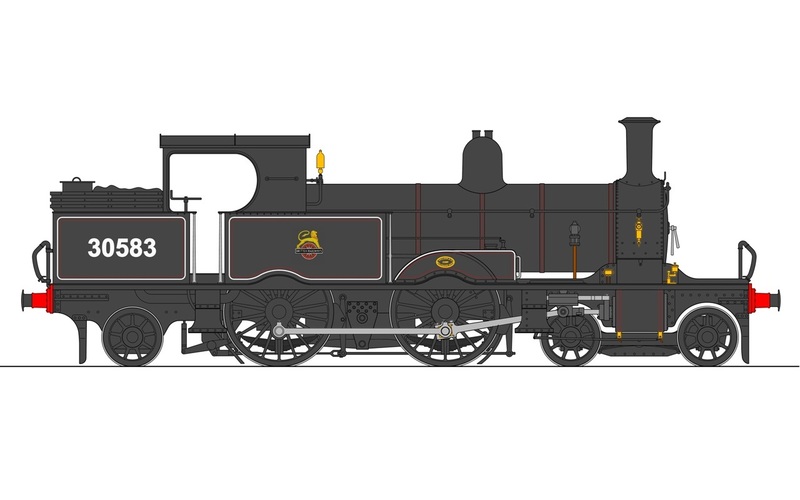 30583 (née 488), was purchased by the Bluebell Railway, chosen because of the three it was the only one retaining the original pattern of boiler (despite having carried a Drummond example during part of its life). After arriving at the line under its own steam it performed sterling work in two different LSWR guises, and in BR livery, up until 1990. At present it is displayed as a static exhibit, as extensive overhaul (probably involving replacement of the boiler barrel) is required before it can steam again but it was recently repainted in BR black for a branch line event held in 2019. The model is 1:32 scale for 45mm gauge track, gas-fired with a single flue boiler. The chassis is constructed from stainless steel, the wheels are uninsulated, the boiler is copper. The model will run round 4′ 6″ radius curves (TBC). The East Kent Railway version is only available from Kent Garden Railways. The anticipated UK RRP will be £1950.00 or £1995.00 for the RTR version (depending on livery), £1795.00 or £1850.00 for the kits. This will be the first Accucraft model to benefit from assembly in Japan, bringing improved build quality and finish as well as giving us the option to offer the model in kit form, a first for Accucraft UK! Boiler Fittings: Safety valve(s), pressure gauge, water gauge.